We are very close to retaining national and local attorneys who are familiar with and successful in working on these type of cases. DAG is pleased to announce that we will join Earthworks and seek intervener status before the courts so that we can be co-defendants in the lawsuit filed against the city of Denton. The city is agreeable to DAG having this status. We will make a more complete statement after the Thanksgiving Holiday. Texas Representative Phil King was elected promising to fight big government and protect local control. He is well on his way to breaking his promise, and becoming the biggest hypocrite in Texas in the process. Because, now that Denton’s voters have banned fracking by ballot initiative, Rep. King wants to prevent other cities from doing the same, and maybe overturn Denton’s ban in the process. Denton’s ban vote was a landslide. The people who know fracking best – there are over 270 fracked wells in Denton, some only 200 feet from homes – said no. And the voters who did so were majority Republican, and elected Republicans in the same election. Before Denton’s ban, King was for small government. Now he says citizens shouldn’t be able to decide how, when, where, or even if fracking happens in their cities. TAKE ACTION: Tell Rep. King to respect democracy! Tell him principles are what you believe in, even when people disagree with you. Texas Railroad Commission chairwoman Christi Craddick has a guest column in today’s Denton Record Chronicle. But where was this concern five years ago when fracking happened across the street from McKenna Park? Where was this concern a year ago when fracking happened less than 200 feet from homes? Or when Denton residents lodged over 300 formal complaints? Where was Ms. Craddick’s commission for all these years when Denton residents struggled to control an industry hell-bent on risking our health and safety for their profits? They were nowhere to be seen. What kind of “ally” acts that way? They thought we would just get tired and give up. They thought wrong. We got angry. We got educated. We got powerful. Years of total silence from Austin and now she says we should “work together.” Years of trying to negotiate with an industry that just kept showing us nothing but the back of its hand and now she laments the absence of a “reasonable model of peaceful cooperation.” Too little. Too late. Yet she doesn’t seem to understand that the people of Denton just voted for that solution. The ban on hydraulic fracturing within Denton’s city limits is the will of our residents and it will mean a stronger economy. Her own words make it clear that there is no conflict between state and local jurisdictions. Her office issues “drilling permits” and “companies doing business here [in Denton] must comply with city ordinances.” That’s right. Companies can still get drilling permits. But to operate in Denton they cannot use the well stimulation technique of hydraulic fracturing. That’s what our new ordinance says. It’s simple. Of course, most of her column is just what we would expect it to be: condescending, out of touch, and full of the same old empty rhetoric. So, without even listening to our actual case (bolstered by peer-reviewed studies), she rides in here and has the nerve to pretend like she’s the real expert. As if those of us who live and work here don’t know the situation a thousand-times better than she does. Ms. Craddick is an armchair General fighting a war that doesn’t exist, some imaginary battle in her head with imaginary radicals. Meanwhile, the voters — of all ages and political stripes — just won the real war. Wake up! A Texas city that votes like the rest of the state on other issues just banned fracking. The Railroad Commission and the industry might want to take the time to actually find out why the ban passed rather than pretend that they already know. Because it’s clear that they don’t know. Ms. Craddick talks about setback requirements as local government’s most useful tool. That’s right. Denton has a 1,200 foot setback requirement. Despite that, fracking continues less than 200 feet from homes. The fact that she does not even mention vested rights indicates her remaining cluelessness. Or worse, if she actually does know this, it indicates that she’s still trying to fool Dentonites. The industry just spent $1 million trying to ‘educate’ us. What part of “we ain’t buying it” does she not understand? No longer can the industry claim the King’s X in Denton. And the time for empty rhetoric is over. You think you’ve got a solution and a “reasonable approach,” then spell it out. With her column, Ms. Craddick had a chance to communicate to a very educated readership. But rather than talk up to our level and to the specifics of our situation, she talked down to us with platitudes and bureaucratese. You want to dialogue? Then get out of the armchair and catch up to us. We are a long ways down the road. I am still in shock. We did it? We actually did it! Against all odds. In January, the day before fracking began in the Meadows at Hickory Creek neighborhood, the Denton Drilling Awareness Group decided to pursue the ban. After years of working to fix our ordinance only to have more fracking 200 feet from homes, we knew the writing was on the wall. What was it going to be: spend the next decade going to community meetings at fire stations and rec centers informing Dentonites that their neighborhood just became an industrial zone? Or draw a line in the sand? We drew the line. And on Tuesday the people of Denton stood with us shoulder to shoulder along that line. We have become a force. I don’t think we can yet fully comprehend the magnitude and the significance of what we accomplished. But I can tell you that it was ten long months. It felt like rolling a boulder up a hill. I wasn’t home very much. Family dinners are a distant memory. There are no words for how grateful I am for the support of all my girls, especially Amber. She saw me through the long nights of work and worry. It was fitting that Election Day was rainy and windy. I stood on a street corner for 12 hours getting soaked to the bone. The wind turned my umbrella inside out. It blew my Frack Free Denton sign out of my hands. And all across the city, other volunteers were standing in the rain until it was pitch black. You see, for ten months the wind was blowing in our faces. All the powers that be were aligned against us. How much easier it would have been to turn our backs and let the wind carry us away – along the comfortable avenues of apathy into the hidden corners of collective irresponsibility. But we stood there in the wind and in the rain. Immoveable. Have you seen the pictures of our volunteers on Election Day? The sun never appeared. It was night all day long. Yet their faces were glowing as if lit up from the inside. That is the light and the splendor of glory. It is the torch of a caring heart. It turns out that Goliath likely had acromegaly. This accounts for his enormous size. But it also gave him double vision and made him profoundly nearsighted. So, although he appears imposing and powerful to onlookers, “the very thing that was the source of his apparent strength was also the source of his greatest weakness.” He could not see things clearly. Doesn’t that ring true about our opponents? The industry outspent us 10:1 but they couldn’t see that a barrage of slick mailers and advertisements (let alone Russian conspiracy theories and personal attacks) was no way to talk to a fiercely independent, intelligent, and unique Denton citizenry. The Board of the Chamber of Commerce couldn’t see how a backroom decision would actually alienate them and put them on the defensive. The Denton County Republican Party couldn’t see that clean air and water and safe neighborhoods are not partisan issues. The Eppstein Group that ran the “responsible drilling” campaign couldn’t see that Dentonites are smart enough to know doublespeak and empty rhetoric when they hear it. The giant was never as strong as he appeared. And we proved that the shepherd boy was never weak. What was the sling in our pocket? What was the source of our strength? It was Tara Linn Hunter, who hasn’t slept in weeks, because she has been coordinating a massive ground campaign by our volunteers. It was Ed Soph, who blended wisdom with a preacher’s fiery passion. It was his wife, Carol, “the hammer,” who spent two straight weeks at the Civic Center chasing down voters. It was the political wit, public health expertise, and enviable sangfroid of Rhonda Love. It was Sharon Wilson who woke us all from our slumbers. It was Cathy McMullen who is my hero. It was Angie Holliday and Nikki Chochrek who are my inspiration. It was the lion-hearted Sandy Mattox. It was the courage of Maile Bush, Debbie Ingram, Alyse Ogletree, and Kelly Higgins. It was Ken and Nicole, who let us use the Greenhouse as command central. It was Alan and everyone else at Earthworks who believed in us and supported us all the way. It was Charlene who gave us a winning image. It was a very special local donor…I don’t know your name but I know the measure of your character. It was the leadership at UNT who protected my academic freedoms in the face of great pressure. You know I could go on and on! It was everyone who knocked on doors, made art and played music (Brave Combo, are you kidding me!! ), distributed flyers, donated money, put out a yard sign (or even made their own! ), made phone calls, hosted fundraisers, built coffin racers (! ), ‘liked’ us and encouraged us on social media, spoke to neighbors and colleagues, serenely ignored the haters, registered voters, did their homework about fracking, and of course VOTED! We were the sling. We were the strength. What we saw in Denton was a victory for grassroots democracy – the kind of thing that’s not supposed to happen anymore in the age of big political money. Well, it just happened. This was the most intense journey I have ever taken. Every day seemed to bring more and more weighty decisions. There were at least two times when I thought for sure we made a catastrophic error. I thought we were doomed. I am happily eating crow now and thankful for my fellow travelers who spoke wisely and judiciously throughout the campaign. The industry will not be running roughshod over Denton anymore. The nightmare that unfolded in the Meadows at Hickory Creek will not be repeated. We will have cleaner air and water and safer neighborhoods. Our kids’ schools, playgrounds, and bedrooms will be protected. And I do believe we will have a stronger local economy as a result of the ban. These are the most important legacies of our efforts. Given the national and international attention we have attracted, there will doubtlessly be much wider impacts. For me, this was always a Denton thing. I always said we were not laying out a blueprint for anyone else. The ban was not about what’s right for other places. It was about our right to self-determination. So, my hope for those broader implications is that local communities are empowered. Those who are most vulnerable to the risks of fracking should have the greatest say. The petition process enfranchised the people – it gave us a voice…and how good it felt to speak! As frack sites proliferate across the world, I hope that those who are put in harm’s way are able to find their voice too. And I hope that those with power and money will listen. We expected the oil and gas industry to sue the citizens of Denton after we voted to ban fracking. Unfortunately, industry has met our expectations. They have apparently learned nothing from last night’s landslide vote. They have taken no time to reflect on their own irresponsible actions that brought the people of Denton to this point. Industry could have taken this moment to address why the ban was passed. Instead they’re going to try to squash it. If justice prevails, and we think it will, they will lose. This is a victory for the citizens of the city of Denton. For our families, for our health, for our homes, and for our future. What does this fracking ban mean? It means we don’t have to worry about what our kids are breathing at city playgrounds. It means we can cheer on the Mean Green without fracking pollution blowing over the football field. And it means we don’t have to worry about our property value taking a nose dive because frackers set up shop 200 feet away. But this ban wouldn’t have passed without the tireless efforts of countless people concerned enough about their city to help make this happen. Unfortunately, not all is sweetness and light. We know the oil and gas industry is going to sue to try to overturn the fracking ban. But we lawyered this ban every which way before launching this effort. And we consulted legal precedents for Texas home rule cities like Denton. And we’re confident it will stand up. We know the oil and gas industry is going to try to use our own state government against us by directing its paid flunkies to overturn the ban in the legislature. Because politicians didn’t pass this ban. This ban is the voice of the citizens of Denton speaking directly to the fracking industry, and local, state and national government: WE HAVE HAD ENOUGH. So try to overturn it if you will. But know that if you do, you are on the side of corporate interests and against the people. Because this isn’t a ban on fracking everywhere. If YOU want fracking in YOUR COMMUNITY, fine! Keep it. But in Denton, we don’t. And if you force it on us anyway, that is the VERY DEFINITION of big government. To those in industry and government who are concerned by the success of this ban, rather than try to overturn it, address why we had to pass it. Because the ban was our LAST RESORT. We tried for years to get government and industry to work with us. And they wouldn’t. This was the only way left open to us. And so we took it. If you want to prevent more bans, especially in towns that know drilling best, do yourselves a favor and listen to concerned citizens. Because if you don’t, you may wind up reaping what you’ve sown. What does “responsible drilling” mean? 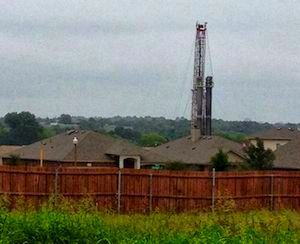 Surely it doesn’t mean the way the industry is behaving in Denton: Fracking less than 200 feet from homes. Ignoring our local rules. Poisoning our families. After all, every industry representative that has ever come before Denton’s City Council has admitted they wouldn’t want to live next to a frack site. They have talked like they understand we have a real problem here. For years, they promised to help fix things. Of course, nothing came of it. It was just talk. That’s all it’s ever been. Buzz words. Doublespeak. Empty rhetoric. Their blueprint for “responsible drilling” is just more of the same. They aren’t spending over $700,000 on this campaign so they can clean up their act. No. They are trying to buy our submission so that they can go right back to exploiting Denton. The bright lights of frack site and noise of semi trucks in the middle of the night in Vintage neighborhood. Photo courtesy of Gena Felker and Britt Utsler. Here’s their definition of responsible drilling: The act of systematically ducking commonsense regulations to frack next to homes and playgrounds, jeopardizing the health and safety of Denton families in order to maximize profits for outside corporations, outside mineral owners, and a handful of residents who make more from fracking than the entire school district. They are trying to pass off profit maximization as the same as property rights. But of course, it doesn’t make sense to have a democratic society if some can use their property in a way that harms the property of others. That would be a monarchy. And that’s precisely the way they are acting. As if they have the King’s X. Exempt from rules that apply to everyone else. Untouchable. The very opposite of being a responsible member of a community. SORE THROAT, TROUBLE IN BREATHING, COUGHING AND HEADACHES DUE TO EMISSIONS FROM GAS WELL DRILLING SITE. SORE THROAT, FATIGUE, NAUSEA AND BAD HEADACHES DUE TO EMISSIONS FROM ALLEGED SOURCE. COMPLAINANT WAS WALKING IN NEIGHBORHOOD AND IS NOW EXPERIENCING BURNING LUNGS, SORE THROAT, COUGHING AND A DIFFICULT TIME CATCHING THEIR BREATH. Our neighbors are suffering. Your neighborhood could be next. The industry’s un-neighborly ways have backed us into a corner. The ban is our last resort; it’s the only way to protect our health, safety, and property. It is a choice between the ban and the continuation of a nightmare.